Owned by Scott and Rebecca. 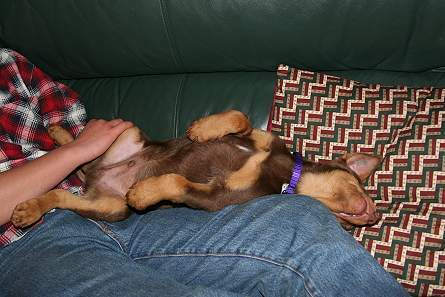 "Thank you both very much for our beautiful pup Roxy. She has settled in really well and we both love her very much. We have taken her to the vet for a check up and have also had her micro-chipped as we don't want to loose her. Everyone at the vets loved her as well. We have enrolled in her in the puppy pre school so she can socialise with other dogs. 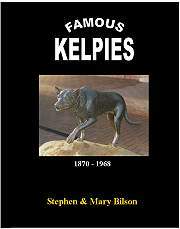 Also thank you for the kelpie basics book. 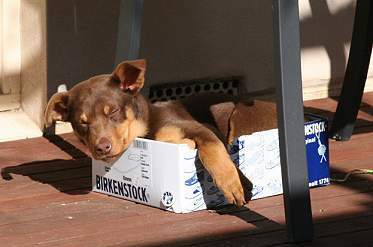 I wish I had had that book when I had my old kelpie. I have attached a few photo's of Roxy and will keep you updated with her progress. Hi Mary, I have been meaning to email you to let you know how little Jimmy is going. But I've been waiting to download some photos - but since I haven't done that I thought I'll email first and I'll send some photos in the next couple of weeks. Jimmy travelled well to Sydney and was no drama whatsoever. He is such a beautiful gorgeous little boy. The kids love him. And he has been doing lots of socialising particularly with children. He rounds the kids and the balls up in the yard - it's just so funny to see. James, Nicola and Joshua just so love him. And so do Graham and I. I knew that I had missed having a dog since Banjo had gone but I didn't realise how very large that void had been until Jimmy joined us. He has filled that empty part with lots and lots of love and hugs. (must admit he does tend to snooze on my lap at night in front of the TV). He has been no trouble. Already starting to really listen, particularly to Graham. He even slept through in his crate after only two nights home - which I thought was unreal (there has been lots of bragging to all our friends about how truly clever he is). I think I love watching the kids interact with him. We have had to set up a roster of who is feeding him on which day cause it was becoming a fight with everyone wanting to do it all the time. Actually today Jimmy has been in the yard with 6 kids playing footy. Each side wanted him on their team because he doesn't let anyone get past. He's great. ...We think he is perfect and love him so very much. Owned by the Harvey family, South Australia. 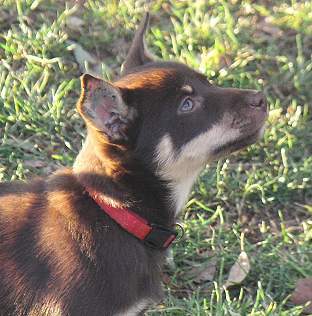 We have named our puppy Ned, a strong Aussie name for a little Aussie legend. 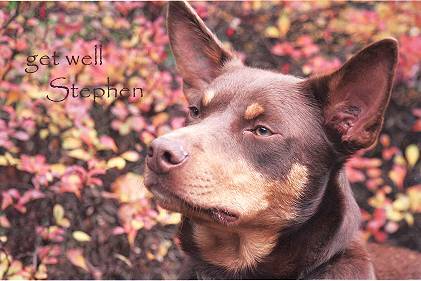 And legend he is-what a wonderful pup, he has brightened our dismal Adelaide Hills winter with lots of laughs and fun. He is just as you described, has a mad few minutes and then collapses on a lap for a sleep and a cuddle. Did you teach him to be such a lap dog or was is that just him? He just sort of becomes sedated once on a lap and drifts off. He is completely adorable and is making many friends both canine and human. He is booked in for vets puppy class and canine good citizen so will be very busy. I will attach 2 photos so you can see how he has settled in. Thank you once again. 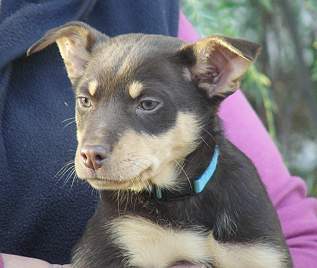 Little Ned is just wonderful , exactly as you said he would be .He heels nicely in town and enjoys a stop at the caf�. That was such good advice and of course he loves everyone. When he is uncertain he sits and thinks about it which is great, he can nearly shake hands and our down is pretty solid. It is easy to forget how young he is. He is a credit to you and your stud. "This is a lovely photo of Ned. He is now 18 weeks old and an absolute joy. He graduated from puppy school, easily the smartest pup there. 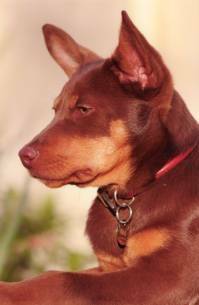 I chose this photo as you can see the mature dog developing in the puppy�s face." "His training is going well. He is cool with the horses and cows, once again the down training was invaluable. As you mention in your book, the �down� blows people away. 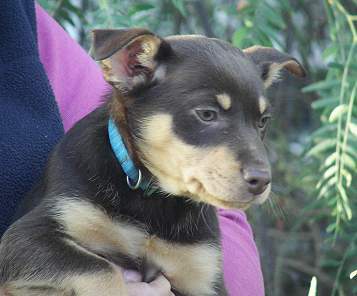 They don�t believe a pup can have self control, but we Kelpie owners expect it! I have started using the clicker and it is fascinating to watch him work things out. The only limit will be my imagination in finding things to teach. Thank you again for breeding such an amazing animal. Ned is now 6 months old and very handsome. He is not going to be very tall ,which suits me fine .He continues to be a joy and we have got over a little bout of independent thinking. 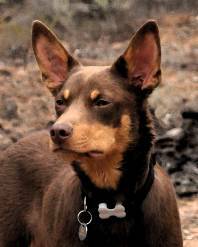 He graduated from Scholars in Collars and will return for more advanced work in the new year. He was easily the best pup there and was eyed enviously by a farmer who came to watch his wife and their naughty Schnauzer. I think he told me every session what a good dog I had. I knew that. I have started taking him out with my horse. We have a large vineyard up the road so we are safe from traffic and I just walk so as not to over do it .Interestingly he just settled into drovers dog position , trailing the horse .My horses are all very unconcerned by dogs so he is not at risk. Life does not get much better than a beautiful day, wandering along with my horse, and Ned. Tomorrow is Ned�s first birthday. We nearly didn�t make it as 5 inches of rain brought out the snakes for a last hurrah. My husband went out the backdoor to investigate barking and found Ned and our 2 Jack Russells surrounding a large black snake poised to strike. They all came immediately when called and I blessed the hundreds of recall repetitions we have practised. No harm done. 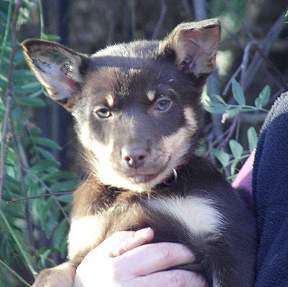 I have joined the Working Kelpie Club and enjoy the newsletters. 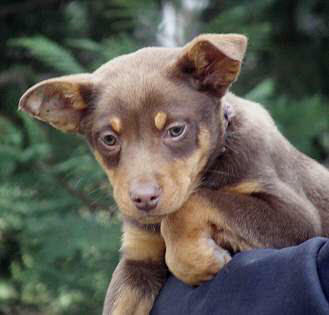 My family fell about laughing when they heard, as Ned is the most joyously unemployed Kelpie you could imagine. The newsletter notifies upcoming events and I am planning to get to a trial when I can. 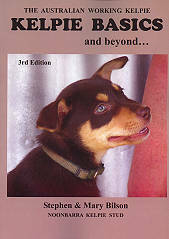 This new latest edition is a great book for beginners or experienced Kelpie owners. 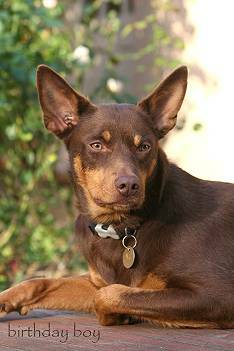 It is designed for good solid foundation training to ensure you get a well balanced, socialised and obedient Australian Working Kelpie.